At the start of the twenty-first century, the world we inhabit appears very different from that of the twentieth century. Instead of being a passive, obedient landscape dominated by “machines for living in”1 , the new millennium appears to require constant renegotiation for our survival amid destructive flits of ill temper in the natural world. Our search for control and security has contributed to this mood swing. The global, intensive use of machines to dampen the oscillations of nature through a progressive process of designed homogeneity has alienated us from the “actual” environment that we inhabit. Indeed, the industrial, top-down control of our world has resulted in mass-produced, sanitized surfaces within our metropolitan spaces and exiled mountains of trash that are thrown “away,” not claimed. The scale of these activities has effectively disconnected us from a far messier, dirtier, and more complex reality that we are no longer equipped to deal with. Uncontrolling weather control., domesticated, or bucolic like twentieth-century nature but appears to possess liveliness, creativity, and strangeness. These qualities are not compatible with the established dichotomies of landscape/building, interior/exterior, or form/function that characterize modernity and demand new approaches toward architectural design. Piloting Oyster-tecture in the New York Harbor.2. Bioplastics! From the kitchen to the field.. Yet we need avatars, or architectural instruments, that can guide us through genuinely new conceptual and methodological terrains that can deal with notions of impermanence, persistent change, and temporality that spans more than a single lifetime. My work combines foundational science, emergent technological platforms, and speculative design projects. I aim to construct architectural avatars that experiment with iterative cycles of proposition and analysis. We require different tools than those of a Newtonian industrial reality—where matter is brute, inert, geometrically configured, and hierarchically ordered. Instead, new technical systems can harness the dynamic properties of matter, which deal with networks, relationships, hubs of organization, and material flows. In this reality, matter is empowered, autonomous, and a potent driver for creative agency. Nobel Prize–winning chemist Ilya Prigogine described a range of substances called “dissipative structures,” which result from the organized dispersal of space-time, and exhibit asymmetry, anisotropy, chaotic behavior and long-range correlations between interacting particles. These characteristics confer them with lifelike qualities such as movement, resilience, and sensitivity to their context. Their distinctive forms are produced by a constant flow of matter and energy and spontaneously occur in nature across many scales, such as tornadoes, whirlpools, convection, and the birth of galaxies. Equally necessary is the foundation of a range of terms that can shape expectations and values of dissipative structures. Process philosophy, which dates back to Heraclitus’s time, describes a reality in continual flux between already active agents. Gilles Deleuze and Felix Guattari described the fundamental operating system of “assemblages,” which are spontaneously formed by loose, reversible associations among heterogeneous groupings of agents, and give rise to technologies with lifelike bodies such as soil. Emerging technology: protocell. Response to constantly changing environmental conditions. Micrographs by Rachel Armstrong, 2009. The system usually self-assembles between the microscale to millimeter scale, at which Bütschli droplets possess an internal force that enables them to exert effects on their surroundings. 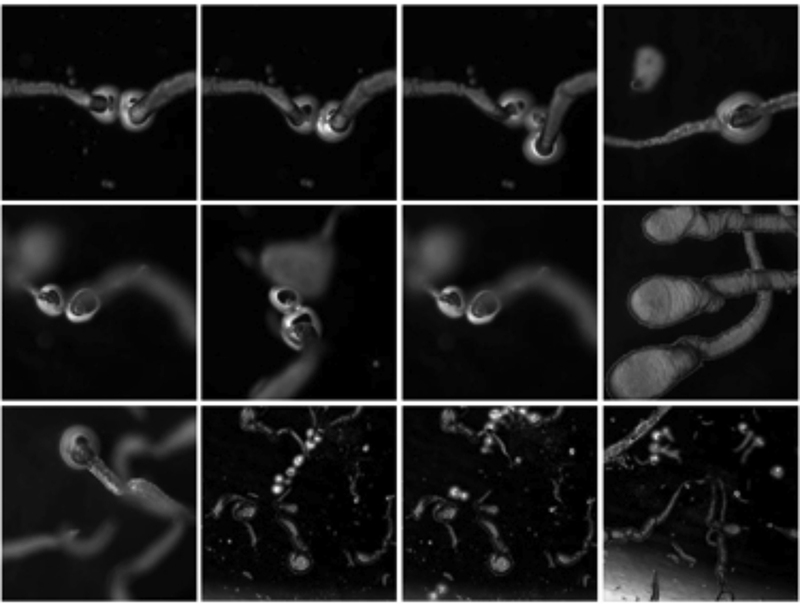 Bütschli droplets can move around their environment, sense it, and even produce microstructures. When the droplets interact with one another they do so in parallel and without a hierarchy. Although they oscillate at points of contact, they generally do not fuse with one another. These intimate interactions confer a great deal of flexibility through the formation of loose, reversible bonds between droplets. Perhaps surprisingly, the behavior of assemblages is rather conservative and predictable. Just as sugar, flour, butter, and eggs yield a delicious cake when they are put into an oven at a particular temperature, assemblages give rise to novel, emergent events when they reach a tipping point. Indeed, tipping points have been observed in the Bütschli system when small populations of droplets may spontaneously change shape and move away from one another. It is not clear exactly how such a tipping point works, but their irreversibility has been well-established in other fields, as when ecosystems collapse. Natural computers are therefore not machines but leaky material systems, which are capable of adaptation and change. They do not use top-down instructive programming such as genetic codes, but orchestrate the intrinsic power of matter. Natural computers may be “operationalized” and become instructable by using the programming language of physics and chemistry. Adding a soluble mineral to alter the “metabolism,” or internal chemical conditions of a droplet, produces a precipitate in the presence of carbon dioxide. Altering external conditions, for example by adding organic solvents like alcohol or acetone (nail polish remover) to the olive oil medium, changes surface tension so that droplets move very rapidly to form large clusters around the solvent source before rapidly becoming inert. But for assemblage operating systems to have architectural and cultural relevance, they must exist at the human scale where they can be readily observed, manipulated, and inhabited. By adding an inhibitor from the end product of their own metabolism, Bütschli droplet interactions could be slowed down so the droplets could be grown to a couple of centimeters in diameter. Detail photograph of dynamic droplet in the Hylozoic Ground installation, 2010. Venice Architecture Biennale. Photograph by Rachel Armstrong, 2010. To test applications of these attenuated, enlarged droplets at an architectural scale it was necessary to entangle their interactions with other assemblages. 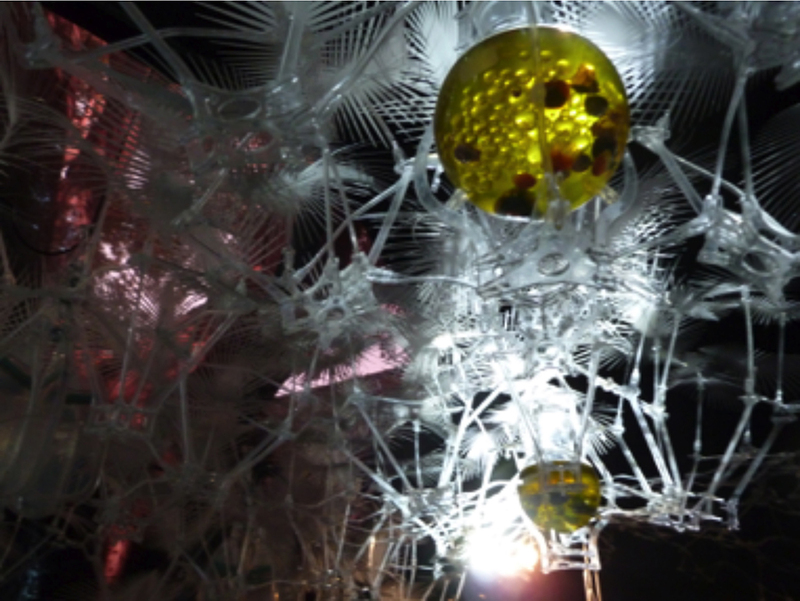 The Hylozoic Ground installation, designed by architect Philip Beesley for the 2010 Venice Architecture Biennale, provided me with a cybernetic context to test modified Bütschli droplets. In this case, the droplets acquired a new set of chemical relationships that produced a solid carbonate in the presence of carbon dioxide. The droplets were suspended between a clear oil, Diethyl Phenyl Phthalate (DEPP), and olive oil. DEPP is denser than Bütschli droplets, which in turn are heavier than olive oil, which provided a viewing platform for the chemical events. Additionally, the DEPP acted as a lens for illuminating the droplets so their transformations could be seen by gallery viewers. Over the course of the three-month installation the modified Bütschli droplets produced brightly colored, structural precipitates in configurations that could be likened to chemical gardens. Considered collectively, the droplet interactions could be thought of as a giant smell or taste system—they responded to dissolved carbon dioxide produced by gallery visitors by changing color just as our gustatory systems respond to dissolved environmental chemicals. Protocell topology. Drawing of droplet configurations designed by Rachel Armstrong and drawn by Simone Ferracina. We worked with Simone Ferracina to make a topological map of the evolving Bütschli system, and classified the results through likeness rather than difference. The diagram proposed to frame epistemological issues within a context of connectivity, which is essential for constructing ecological programs. The drawing navigates the many possible outcomes that may arise when a drop of strong alkali meets an olive oil field. Centered on an origin at time zero, a series of dashed, concentric circles radiates to represent exponentially increasing time periods. A spiral indicating increasing complexity also emanates from the origin, showing the greatest number of possible transformations clustered around the beginning of the reaction. Within these fields, droplet phenomena were recorded from more than three hundred Bütschli experiments and grouped according to aesthetic criteria. We also described the configurations metaphorically to indicate attributes and relationships beyond their morphological qualities. For example, the “werewolf phenomenon” is a transitional state in the Bütschli system that produces an optimal ratio between the body mass of a droplet and its reactive surface area. This results in a rapid increase of the droplet mass in the form of “hairy” crystals, suddenly deposited over the surface with a “tail-like” structure. This dramatic change in shape and drag causes the droplet to appear suddenly agitated and furry—reminiscent of lycanthrope mythologies. When the active droplet interface is completely occluded, the system becomes inert and the “werewolf” perishes. 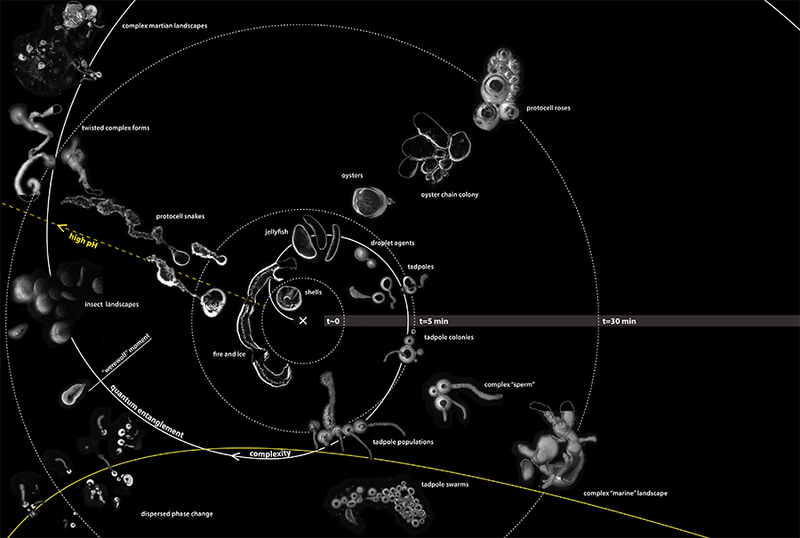 The Bütschli topological map thus identifies relationships between active materials, bodies, systems, and agencies, and imagines how metabolically active sites can address spatial programs and ecological networks in architectural applications. Future Venice—empowers the foundations of the city with the capacity to engage in a natural “struggle for survival.” Photographs by Rachel Armstrong, 2010. We designed an urban-scale project based on laboratory experiments, field studies, and speculative design to accompany the technical platform in Future Venice. The project studied whether assemblage technology could go beyond existing technical systems such as the Moses gates: a series of 78 hydraulically operated gates that, like a giant, robotic King Canute, would stop the Adriatic’s acqua alta from periodically flooding the city. We designed a dynamic droplet “species” that could confer the ancient foundations of the city with lifelike qualities and participate in a natural “struggle for survival.” The lagoon of Venice would support the growth of an artificial limestone reef under the city around the woodpiles on which it stands. With the strategic deposition of solid matter, the point load of the city could be spread over a solid area, and Venice would be prevented from sinking into the soft delta soils on which it was founded. To achieve this objective, droplets were designed to move away from the light and toward the city’s submerged foundations. We conceived of and tested a second metabolism that would kick in when the initial droplets came to rest, and use dissolved minerals and carbon dioxide to produce a kind of “biocrete.” Collectively the system functioned as an accretion technology whose activity could be titrated as needed by adding droplets to the light-soaked waterways. Interestingly, field studies of the waterways indicated that marine organisms were already producing their own kind of biocrete. Following this observation, we no longer imagined the project as a human-directed program, like a smart-concrete, but as a chemical communications strategy that could converse directly with Venetian wildlife and use resources to boost the natural mineralization processes of algae, bacteria, and shellfish. In this way, the droplet technology functioned no longer as a progressive form of modernism—in which a technologically sophisticated, top-down program could achieve a definable end point—but as a form of “marine gardening” that could work with the lagoon’s natural computation. In other words, the reef would be a material product of co-design between humans and nonhumans. The reef could be viewed by city inhabitants at low tide. Moreover, should environmental conditions of Venice veer from current predictions and dry out, then the assemblage operating system could change the range of its outputs. Rather than growing sideways to spread the minerals over a broad base, the accretion-producing droplets could deposit layers of crystals on the woodpiles, sealing them from the air and preventing them from rotting. Decomposition of the timber foundations is a real challenge for Venice since the posts decay when exposed to the air, which occurs, for example, in the wake of giant ocean liners that pass through the lagoon.10 In a related proposition, researchers such as Pietro Tiatini and his colleagues11 are modeling the possibility of lifting the city by a foot over a ten-year period by inflating aquifers previously drained by industry. In either case, there is a need for a material solution that could dynamically seal exposed woodpiles at the moment of exposure. 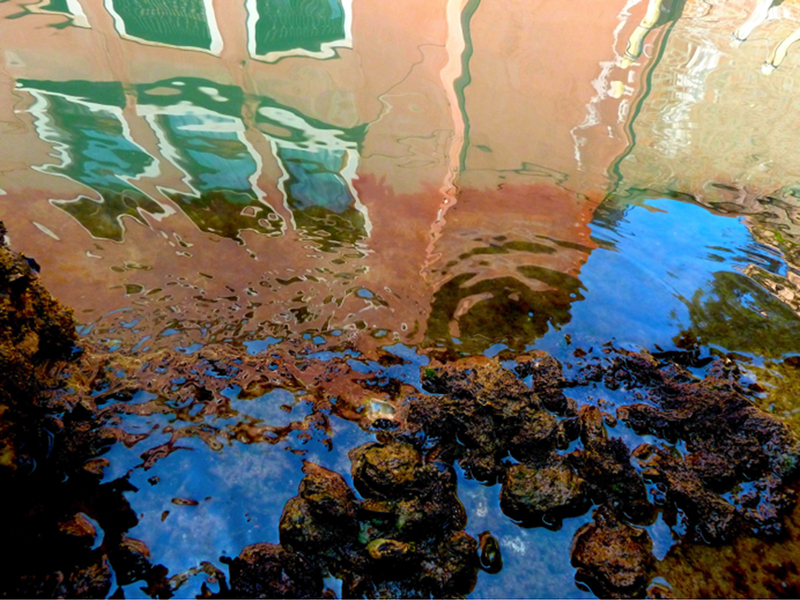 Reengineering the very geological foundations of Venice is a challenging intervention as the city is a UNESCO World Heritage Site, with many buildings subject to complex legal and governance systems. Yet, the foundations of the buildings themselves are situated in the lagoon, not the city, whose highly biodiverse ecosystem has become the subject of recent conservation interests in the face of the looming Moses project. Environmentalists are increasingly concerned that raising the floodgates will have devastating effects on the lagoon ecology due to stagnation of the water and the backup of industrial waste. Future Venice envisions architecture not as a secondary condition for “life” but as a primary driver of conditions for its very emergence. Even in the production of soils and water infrastructures, an alternative approach to the construction of ecological systems may be developed. Future Venice proposes that small, subtle events can radically steer the fabric of Venice away from material decay. A dynamic network of potential architectural events can be shaped by lifelike assemblages working in collaboration with the marine wildlife and city inhabitants. How (not) to experiment in a volatile, uncertain, complex and ambiguous world.. Even beyond the direct and enduring effects on the buildings and lagoon is the broader notion of the control of the droplet system, which is most likely to be titrated in response to calculations made by continual monitoring and then released directly into the lagoon water by boat. (We even considered “grey goo” scenarios,12 which technologically could threaten to consume the environment, during the experimental phase of our design process to explore unwanted outcomes.) Droplet behavior in the laboratory suggested that control of the active phase of the droplets depended on resource availability. Droplets moved in the presence of light and produced insoluble crystals when they came in contact with impurities and dissolved carbon dioxide. In their absence, the droplets were passive and gradually formed an oil film that dissipated with water agitation. Since dynamic droplets do not possess any central programming system, like DNA, they operate according to the principles of soft control. Their operations are distributed, dependent upon environment, and require control operations akin to gardening or cooking, in which ingredients are orchestrated throughout the process. Also, although dynamic droplets can spontaneously divide, they cannot self-replicate, so their actions are ultimately limited by the physics and chemistry of the system unless specific programs are put into place that prolong their activity. These observations do not negate ethical concerns for natural computing but suggest a set of principles by which architects could make informed decisions as they apply this technical system. Research as a place apart., as in the Phillips Microbial Home,13 where bioprocessors situated within voluptuous vessels transform waste products into substances useful to a local ecosystem. Strategically positioned, these architectural organs may give rise to buildings with physiologies that strengthen the material exchanges within a community through networks of metabolic processes and act as biotic, life-promoting oases for human and nonhuman communities. Gradually, our homes may be sites for rich, instrumented ecologies, as assemblage technology and elemental infrastructures evolve. These “organs” within buildings may support a diverse range of luxury items, which are fueled by bioprocesses for lighting, decomposing waste, recycling plastics, and even encouraging pollinators to keep our cities fertile. Rather than being regarded as two-dimensional plots of land, territories may be valued as multidimensional spaces that promote fertility by facilitating the movement of matter through communities of human and nonhumans, which thrive on openness, community, and exchange. Physics and chemistry provide a common language so that natural and technological forces work synergistically, to transform matter into substances with high biotic value, which differentially shape space. The spontaneous flow of matter and many acts of transformation within an environment may be regarded as a metropolitan-scale economy. The exchange and transformation of matter within an environmental niche could determine its value and may be increased in any site by harnessing bioprocessing activities such as composting, food, and energy production. Climatic architecture at the end of calculation.2. Lab Overboard! Our living spaces are not exclusively human and require the investment of the nonhuman world. Sustainable societies may therefore be defined by local, open agreements that shape the myriad of material exchanges in our urban spaces, in ways that enable the participating systems to evolve. In a metabolic economy, the transformation of resources within individual living spaces may directly contribute to the prosperity of the ecosystem so that inhabitants do not just consume but also produce their surroundings in ways that may shape the way that human-occupied spaces are inhabited. The cultural, moral, and ethical systems of a community may be shaped by lively exchanges between cooperating bodies within an ecosystem. For example, SymbioticA’s “Victimless Leather” offers another way of producing meat than by slaughtering animals,14 and provoked technological innovation whereby it became possible to make cultured meat burgers15 and leather16 without animal suffering. In this age of uncertainty, architects can engage assemblage platforms to design an ecosystem of new material relationships. The combined use of laboratory experiment and speculative design engages aesthetic arguments that can address the cultural impacts of emergent technology and go beyond the empirical limits of the classical scientific “hypothesis.” Such methods avoid overdefined goals at the outset of an experiment and keep the conversation open to possibilities. Designers operating in highly complex contexts may feel like they’re nailing jelly to the wall and seek architectural design strategies for working with evolving environments and ecologies. Indeed, the architect’s role is a deeply engaged one that requires personal commitment and an ethical framework that may not only help inform design decisions but offer principles that are transferable. In this way communities that will ultimately inhabit and shape emerging sites may operate according to a set of cultural rules and codes for ecological engagement. 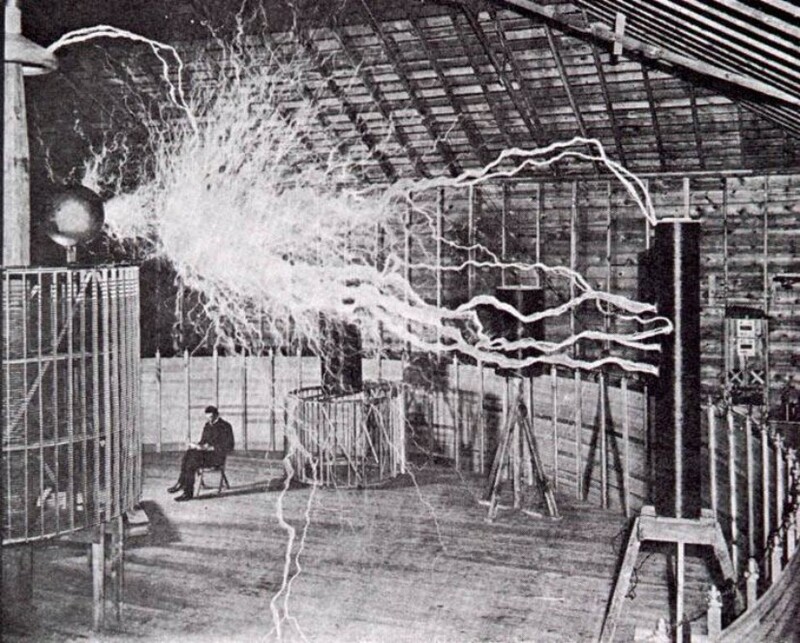 While the modern world brought many advances, its very success threatens our continued existence. Still, the goal is not to eradicate modern approaches but to create avant-garde spaces of diverse architectural choice. Using experimental design avatars, we may just be able to tap into the creative potential of the dynamic material world—not to subordinate and consume it but to use its astonishing power of transformation to innovate organically. It may even be possible to ultimately transform the resource-consuming industrial processes that underpin contemporary architecture into life-giving ecological ones. We may even provoke acts of co-design within the dynamic material realm to give rise to extraordinary new environmental solutions. Rachel Armstrong is a Senior Lecturer at the Department of Architecture & Landscape, University of Greenwich. She is also a 2010 Senior TED Fellow who is establishing an alternative approach to sustainability that couples with the computational properties of the natural world to develop a 21st century production platform for the built environment, which she calls “living” architecture.